The daily Cartwheel deals are back! Now through Thanksgiving Day, Target will be offering up to 50% off a different Kids’ Daily Deal! 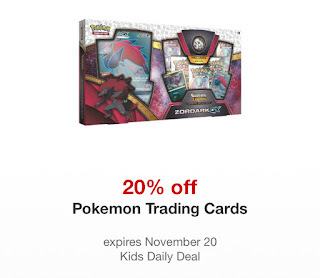 Today, November 20th only, save 20% on Pokemon Trading Cards with the Target Cartwheel offer.